Charities are invited to submit grant applications - annually we give out over £30,000 - Fill in a Form and make your case ! Our next round of donations will be in early 2020. Apply now for the 2019-2020 season. This Christmas, the Cambridge-South Club will once again be organising and staffing various University-site car parks in Cambridge City centre over the festive period to raise funds for charities. 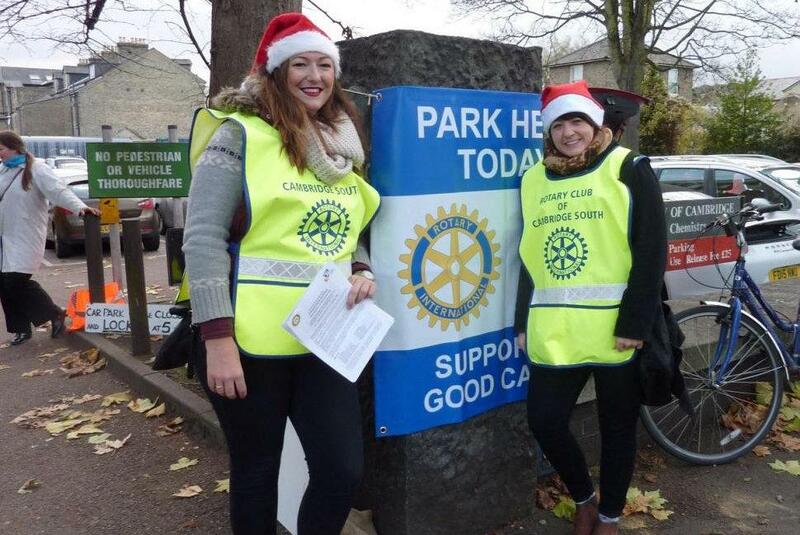 For many years, Cambridge South Rotary has raised funds by providing car-parking facilities in central Cambridge over the busy Christmas and New Year periods. With the cooperation of Cambridge University, the Club raised more than £40,000 last winter. Since then, these funds have been distributed between several local, national and international charities. Former Club President Duncan Hanny-Robertson said "Last year the club donated money to a range of charities including Winter Comfort, Shelter Box, Naalarami School (Tanzania) and Camsight. You might think that standing around in freezing cold and draughty car parks would be a chore, but every year the entire Club works together and really enjoys the team effort. One hundred percent of every pound we raise through car-parking goes to needy causes, and we're looking forward to improving on the total money we raised last year." Now, with the next Christmas period looming, the Club is finalising its list of preferred charities which will benefit from this winters efforts. Also, if you know of any charities or community causes which might benefit from these funds, please contact Rotarian Roger Webster. There is a formal application process, so Roger will send you the necessary forms and help you throughout the process - or use the link above. Applications close on 30th September 2019, so please ensure applications are lodged before then.